LAST Wednesday's issue of the Border Watch contains some remarks contributed by the Duke of Argyle on the above subject, but dealing more particularly with the traces of fossil flora found in extreme northern latitudes. After referring to the striking and curious natural phenomena found in the rocks of Greenland, the Duke refers to an older flora than the Miocene, and says that this is the flora of the coal measures. He remarks-"Yet this flora, too, in long ages before the Miocene, has certainly flourished on the area which is now occupied by Greenland, and that it must have been associated with a tepid and steamy atmosphere. It is needless to point out what curious questions these facts raise." In connection with the above, and without referring to the beautifully elaborated theories of La Place, there is such a large amount of reasoning presenting to one's mind-that it is so difficult to know how to condense in one short and readable article something that will be instructive. Referring to creative agencies in the past ages it will be necessary to abandon the very prevalent idea that climate, atmosphere and earth surface, were then as now. When we read of gigantic animals, men, and forest trees, we must remember that all these had their birth, life, and decay in a period of time when the operations of natural law were as they always have been, the inevitable result of the physical forces of the period. In asserting this I do not desire to be classed amongst "those who deny the requirements of the addition to ordinary matters of an unmaterial and spiritual essence, substance, or power, general or local, whose presence is the efficient cause of life." On the contrary, I believe that the forces and the director of them are both eternal. "The agency of plants in purifying the primitive atmosphere was long since pointed out by Brongneart, and our great stores of fossil fuel have been derived from the decomposition, by the ancient vegetation of the excess of carbonic acid of the early atmosphere, which, through this agency, was exchanged for oxygen gas. In this connection the vegetation of former periods presents the curious phenomenon of plants allied to those now growing beneath the tropics flourishing within the Polar circles. 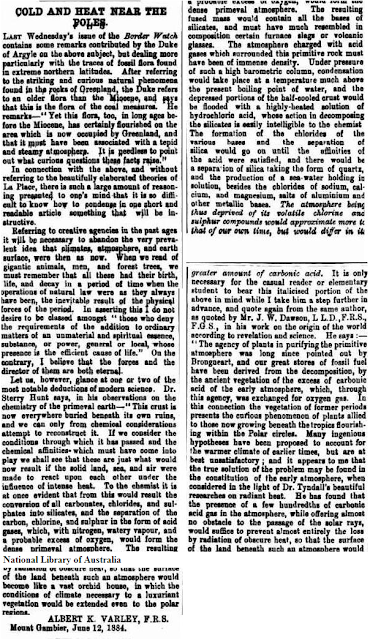 Many ingenious hypotheses have been proposed to account for the warmer climate of earlier times, but are at best unsatisfactory; and it appears to me that the true solution of the problem may be found in the constitution of the early atmosphere, when considered in the light of Dr. Tyndall's beautiful researches on radiant heat. He has found that the presence of a few hundredths of carbonic acid gas in the atmosphere, while offering almost no obstacle to the passage of the solar rays, would suffice to prevent almost entirely the loss by radiation of obscure heat, so that the surface of the land beneath such an atmosphere would become like a vast orchid house, in which the conditions of climate necessary to a luxuriant vegetation would be extended even to the polar regions. ALBERT K. VARLEY, F.R.S. Mount Gambier, June 12, 1884. Click here for more flashbacks. 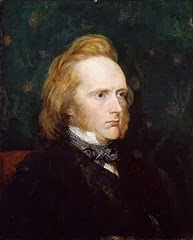 George John Douglas Campbell, 8th Duke of Argyll, KG, KT, PC, FRS, FRSE (30 April 1823 – 24 April 1900), styled Marquess of Lorne until 1847, was a Scottish peer, Liberal politician as well as a writer on science, religion, and the politics of the 19th century. Argyll was also a scientist, or at least a publicist on scientific matters, especially evolution and economics. He was a leader in the scholarly opposition against Darwinism (1869, 1884b) and an important economist (1893) and institutionalist (1884a), in which latter capacity he was quite similar to his political opponent, Benjamin Disraeli. While some of his works seemed strangely reactionary and obsolete at the times and for many decades, recent trends in scholarship - in evolutionary and institutional economics, as well as in ("post-genomic") biology - have led to some very positive re-evaluation of his work. Though regarded by some professional scientists as an amateur, his ability, knowledge, and dialectic power made him a formidable antagonist, and enabled him to exercise a useful, generally conservative, influence on scientific thought and progress. In 1851, he was elected a Fellow of the Royal Society and was appointed Chancellor of the University of St Andrews. Three years later, he became additionally Rector of the University of Glasgow. Pierre-Simon, marquis de Laplace (23 March 1749 – 5 March 1827) was a French mathematician and astronomer whose work was pivotal to the development of mathematical astronomy and statistics. He summarized and extended the work of his predecessors in his five-volume Mécanique Céleste (Celestial Mechanics) (1799–1825). This work translated the geometric study of classical mechanics to one based on calculus, opening up a broader range of problems. In statistics, the Bayesian interpretation of probability was developed mainly by Laplace. Laplace is remembered as one of the greatest scientists of all time. Sometimes referred to as the French Newton or Newton of France, he possessed a phenomenal natural mathematical faculty superior to that of any of his contemporaries. Laplace became a count of the First French Empire in 1806 and was named a marquis in 1817, after the Bourbon Restoration. Thomas Sterry Hunt (September 5, 1826 – February 12, 1892) was a United States geologist and chemist. Hunt was born at Norwich, Connecticut. He lost his father when twelve years old, and had to earn his own livelihood. In the course of two years he found employment in a printing office, in an apothecary shop, in a book store and as a clerk. He became interested in natural science, and especially in chemical and medical studies, and in 1845 he was elected a member of the Association of American Geologists and Naturalists at Yale – a body which four years later became the American Association for the Advancement of Science. In 1859 he was elected fellow of the Royal Society, and he was one of the original members and president of the Royal Society of Canada. He was made Chevalier or the Legion of Honor in France and an honorary doctor of laws of the University of Cambridge. He was a frequent contributor to scientific journals, writing on the crystalline limestones, the origin of continents, the chemistry of the primeval earth, on serpentines, etc. He also wrote a notable Essay on the History of the names Cambrian and Silurian (Canadian Naturalist, 1872), in which the claims of Sedgwick, with respect to the grouping of the Cambrian strata, were forcibly advocated. Hunt first proposed the theory which linked climate change to concentrations of carbon dioxide in the atmosphere at a meeting for the British Society for the Advancement of Science in the fall of 1878. This was a few years before Arrhenius established the theory of the greenhouse effect. He died in New York City on the 12th of February 1892. The Thomas-Sterry-Hunt International Ecological Reserve, an ecological reserve in Quebec, Canada was established on September 7, 1988. Sir John William Dawson, CMG, FRS, FRSC (October 13, 1820 – November 19, 1899), was a Canadian geologist and university administrator. John William Dawson was born in Pictou, Nova Scotia, where he attended and graduated from Pictou Academy. Of Scottish descent, Dawson attended the University of Edinburgh to complete his education, and graduated in 1842, having gained a knowledge of geology and natural history from Robert Jameson. Dawson returned to Nova Scotia in 1842, accompanying Sir Charles Lyell on his first visit to that territory. Dawson was subsequently appointed as Nova Scotia's first superintendent of education. Holding the post from 1850 to 1853, he was an energetic reformer of school design, teacher education and curriculum. Influenced by the American educator Henry Barnard, Dawson published a pamphlet entitled, "School Architecture; abridged from Barnard's School Architecture" in 1850. One of the many schools built to his design, the Mount Hanley Schoolhouse still survives today, including the "Dawson Desks" named after him. Dawson's travels as school superintendent allowed him to deepen his geological studies, as he visited and studied geological sites across the region. He entered zealously into the geology of Canada, making a special study of the fossil forests of the coal-measures. From these strata, in company with Lyell (during his second visit) in 1852, he obtained the first remains of an air-breathing reptile named Dendrerpeton. From 1855 to 1893 he was professor of geology and principal of McGill University in Montreal, an institution which under his influence attained a high reputation. In 1859 he published a seminal paper describing the first fossil plant found in rocks of Devonian origin. Although his discovery did not have the impact which might have been expected at the time, he is now considered one of the founders of the science of palaeobotany. He later described the fossil plants of the Silurian, Devonian and Carboniferous rocks of Canada for the Geological Survey of Canada (1871–1873). He was elected FRS(Fellow of the Royal Society) in 1862. When the Royal Society of Canada was created he was the first to occupy the presidential chair, and he also acted as president of the British Association at its meeting at Birmingham in 1886, and president of the American Association for the Advancement of Science. Sir William Dawson's name is especially associated with Eozoon canadense, which in 1865 he described as an organism having the structure of a foraminifer. It was found in the Laurentian rocks, regarded as the oldest known geological system. His views on the subject were contested at the time, and have since been disproven, the so-called organism being now regarded as a mineral structure. He was created CMG in 1881, and was knighted in 1884. In his books on geological subjects he maintained a distinctly theological attitude, declining to admit the descent or evolution of man from brute ancestors, and holding that the human species only made its appearance on this earth within quite recent times. In 1882, while looking to fill the vacancy left at McGill by the death of botanist James Barnston, Dawson contacted Asa Gray of Harvard University for recommendations. Gray suggested his former assistant David P. Penhallow, who Dawson accepted as a lecturer. Alexandre Brongniart (10 February 1770 – 7 October 1847) was a French chemist, mineralogist, and zoologist, who collaborated with Georges Cuvier on a study of the geology of the region around Paris. He was the son of the architect Alexandre-Théodore Brongniart and father of the botanist Adolphe-Théodore Brongniart. Born in Paris, he was an instructor at the École de Mines (Mining School) in Paris and appointed in 1800 by Napoleon's minister of the interior Lucien Bonaparte director of the revitalized porcelain manufactory at Sèvres. The young man took to the position a combination of his training as a scientist— especially as a mining engineer relevant to the chemistry of ceramics— his managerial talents and financial acumen and his cultivated understanding of neoclassical esthetic. He remained in charge of Sèvres, through regime changes, for 47 years. Brongniart introduced a new classification of reptiles and wrote several treatises on mineralogy and the ceramic arts. He also made an extensive study of trilobites and made pioneering contributions to stratigraphy by developing fossil markers for dating strata. Brongniart was also the founder of the Musée national de Céramique-Sèvres (National Museum of Ceramics), having been director of the Sèvres Porcelain Factory from 1800 to 1847. In 1823, he was elected a foreign member of the Royal Swedish Academy of Sciences. John Tyndall was a man of science—draftsman, surveyor, physics professor, mathematician, geologist, atmospheric scientist, public lecturer, and mountaineer. Throughout the course of his Irish and later, English life, he was able to express his thoughts in a manner none had seen or heard before. His ability to paint mental pictures for his audience enabled him to disseminate a popular knowledge of physical science that had not previously existed. Tyndall's original research on the radiative properties of gases as well as his work with other top scientists of his era opened up new fields of science and laid the groundwork for future scientific enterprises. Tyndall was born in Leighlinbridge, County Carlow, Ireland. His father was a local police constable, descended from Gloucestershire emigrants who settled in southeast Ireland around 1670. Tyndall attended the local schools in County Carlow until his late teens, and was probably an assistant teacher near the end of his time there. Subjects learned at school notably included technical drawing and mathematics with some applications of those subjects to land surveying. He was hired as a draftsman by the government's land surveying & mapping agency in Ireland in his late teens in 1839, and moved to work for the same agency in England in 1842. In the decade of the 1840s, a railroad-building boom was in progress, and Tyndall's land surveying experience was valuable and in demand by the railway companies. Between 1844 and 1847, he was lucratively employed in railway construction planning. In 1847 Tyndall opted to become a mathematics and surveying teacher at a boarding school in Hampshire. Recalling this decision later, he wrote: "the desire to grow intellectually did not forsake me; and, when railway work slackened, I accepted in 1847 a post as master in Queenwood College." Another recently arrived young teacher at Queenwood was Edward Frankland, who had previously worked as a chemical laboratory assistant for the British Geological Survey. Frankland and Tyndall became good friends. On the strength of Frankland's prior knowledge, they decided to go to Germany to further their education in science. Among other things, Frankland knew that certain German universities were ahead of any in Britain in experimental chemistry and physics. (British universities were still focused on classics and mathematics and not laboratory science.) The pair moved to Germany in summer 1848 and enrolled at the University of Marburg, where Robert Bunsen was an influential teacher. Tyndall studied under Bunsen for two years. Perhaps more influential for Tyndall at Marburg was Professor Hermann Knoblauch, with whom Tyndall maintained communications by letter for many years afterwards. Tyndall's Marburg dissertation was a mathematical analysis of screw surfaces in 1850 (under Friedrich Ludwig Stegmann). He stayed at Marburg for a further year doing research on magnetism with Knoblauch, including some months' visit at the Berlin laboratory of Knoblauch's main teacher, Heinrich Gustav Magnus. It is clear today that Bunsen and Magnus were among the very best experimental science instructors of the era. Thus, when Tyndall returned to live in England in summer 1851, he probably had as good an education in experimental science as anyone in England. An index of 19th century scientific research journals has John Tyndall as the author of more than 147 papers in science research journals, with practically all of them dated between 1850 and 1884, which is an average of more than four papers a year over that 35-year period. With this setup Tyndall observed new chemical reactions produced by high frequency light waves acting on certain vapors. The main scientific interest here from his point of view was the additional hard data it lent to the grand question of the mechanism by which molecules absorb radiant energy. Tyndall was an experimenter and laboratory apparatus builder, not an abstract model builder. But in his experiments on radiation and the heat-absorptive power of gases, he had an underlying agenda to understand the physics of molecules. This agenda is explicit in the title he picked for his 1872 book Contributions to Molecular Physics in the Domain of Radiant Heat. It is present less explicitly in the spirit of his widely read 1863 book Heat Considered as a Mode of Motion. Besides heat he also saw phenomena of magnetism and sound propagation as reducible to molecular behaviors. Invisible molecular behaviors were the ultimate basis of all physical activity. With this mindset, and his experiments, he outlined an account whereby differing types of molecules have differing absorptions of infrared radiation because their molecular structures give them differing oscillating resonances. In January 1859, Tyndall began studying the radiative properties of various gases. Part of his experimentation included the construction of the first ratio spectrophotometer, which he used to measure the absorptive powers of gases such as water vapor, "carbonic acid" (now known as carbon dioxide), ozone, and hydrocarbons. Among his most important discoveries were the vast differences in the abilities of "perfectly colorless and invisible gases and vapors" to absorb and transmit radiant heat. He noted that oxygen, nitrogen, and hydrogen are almost transparent to radiant heat while other gases are quite opaque. Tyndall's experiments also showed that molecules of water vapor, carbon dioxide, and ozone are the best absorbers of heat radiation, and that even in small quantities, these gases absorb much more strongly than the atmosphere itself. He concluded that among the constituents of the atmosphere, water vapor is the strongest absorber of radiant heat and is therefore the most important gas controlling Earth's surface temperature. He said, without water vapor, the Earth's surface would be "held fast in the iron grip of frost." He later speculated on how fluctuations in water vapor and carbon dioxide could be related to climate change. Albert K. Varley looks to have once been Clerk of the Council of the District of Mount Gambier. He seems to have been a scientist as well, having "published evidence of what he believes to be a very common cause of typhoid fever, and one which is very generally overlooked. Firmly convinced that the consumption of impure water is one of the chief causes of' the disease, he traces a distinct connection between the use of tanks as receptacles of drinking water, and the spread of typhoid fever." Click here for more flashbacks relating to climate and earth science from the National Library of Australia. Just recently some denialist types who were trying to convince me that the global warming "scare" was all Michael Mann's doing. 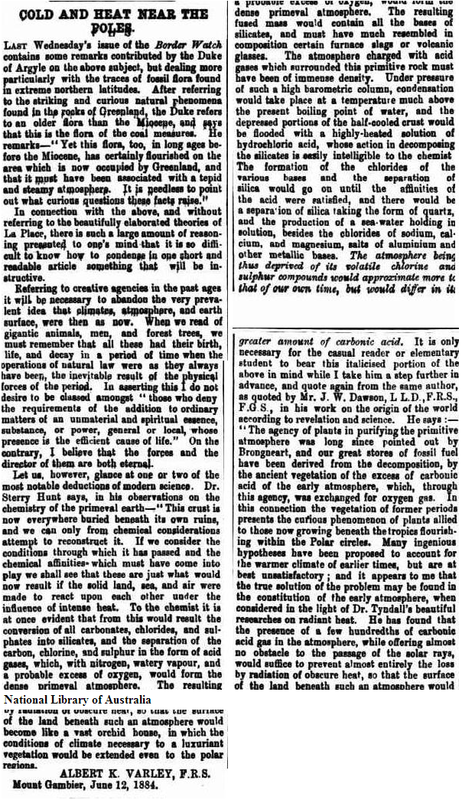 Now you're sharing a newspaper article from June 14, 1884 that supports the claim that the atmospheric processes of global heat retention, was understood in rough outline and much discussed over a century ago. I'll have to see if this article makes any impression on them. although I was surprised you didn't include a bio of Dr. Tyndall, although I guess he's already pretty well known… among some. It's interesting what you can find in newspapers going back in time. Mount Gambier is a town in South Australia, known for its blue lake. Back then it was probably a reasonably prosperous small country town supporting pastoral properties in the region. The "who" should have been deleted up there. Sou, your "Flashbacks" impressed me enough that I couldn't resist Reposting it… at both my sites! You're doing an great job over here please keep it up. It appears that 5 years before Tyndall, one Eunice Foote experimented with carbon dioxide and concluded that its increase in the atmosphere would cause heating. "...Thirdly, a high effect of the sun's rays is produced in carbonic acid gas. One receiver being filled with carbonic acid, the other with common air, the temperature of the gas in the sun was raised twenty degrees above that of the air. The receiver containing the gas became very sensibly hotter than the other, and was much longer in cooling. An atmosphere of that gas would give to our earth a much higher temperature; and if there once was, as some suppose, a larger proportion of that gas in the air, an increased temperature must have accompanied it, both from the nature of the gas and the increased density of the atmosphere." Spencer Weart references her alongside Tyndall. If this helps, I tracked down a photo-image of the journal quoted, emailing it to the author of the monograph (Sorenson) and Spencer Weart, who later added the reference at his site. What is the other theme of HotWhopper? Well that dovetails. One of the reasons I got interested in this a few years ago was to promote a woman who probably would not have been allowed to present her own work at the science society meetings in those times. Posted to a few climate blogs in 2011 hoping it'd get a brief article, but no one took it up except Weart with the footnote.